Hello there! This is my entry for my recent trip to the Philippines. I was home last 24 January to 31 January 2017 but I stayed most of my vacation in the beautiful places of Visayas. It was July 2016 when I was informed that CebuPacific Airlines will be having their promotion, so to cut the long story, I was able to buy multi city round trip ticket for only Php 1,383.00! Entry point was in Dumaguete and exit point was Cebu. Our plan was to take the earliest ferry trip possible to Siquijor, so we haggled for the cheapest trike fare to Dumaguete port and we got it for Php150.00. We arrived minutes before 7am (1st trip) but unfortunately, the shipping company didn’t allow us to board as they were fully booked (only Montenegro shipping lines is available that time, small ferries were not allowed because of the storm. geez). I took a shot of the fare and ferry schedule as shown below for your reference. Silliman University is the oldest American University in Asia. It is located in the heart of Dumaguete City, and is walking distance from Dumaguete port and Rizal Boulevard. Just 10mins walk away from the port, you’ll be able to see the famous Sans Rival Restaurant. Known for their Filipino dessert Sans Rival and Silvanas, this is definitely a must when you visit the City of Gentle People. Along the way to look for a place to eat breakfast is the long stretch of Rizal Boulevard. It is named after our national hero, Dr. Jose Rizal. It’s been said that he had made a brief visit and stroll here before departing to the island of Dipolog, where he was exiled for years during the Spanish colonization. We also had a short visit to the Belfry tower, one of the must visit places in the city. no pictures though. We were able to secure tickets to Siquijor despite of the long queue because of the limited trips available. It costs Php 130.00 and Php 15.00 for terminal fee. 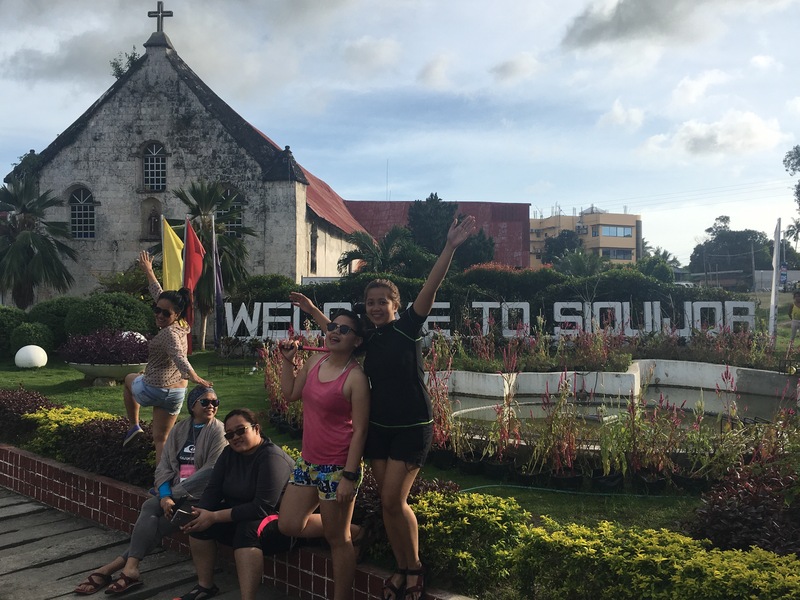 It was more than an hour of cruising and we finally set foot on the majestic island of Siquijor. There are many folk legends in this mystique island, many of these are scary folk tales of paranormal nature. My friends were hesitant at first if they wanted to spend an overnight, but I insisted. Curiosity was slowly killing me months before this trip. haha! Beach bumming in San Juan, Siquijor. After a month of dieting and working out prior to this trip, I felt like rewarding myself for my discipline and focus, so I bought beers and celebrate with my travel buddies. haha! cheers to cap off the night! Our call time was 4:00am as we need to start the activity by 6:00am for us to catch the 4:00pm ferry to Dumaguete. We haggled for the whole trip (transpo + entrance fee) for Php 1,800.00/5 pax and first in our itinerary was spelunking in Cantabon Cave. After an hour and a half, we survived the spelunking! By the way, we paid a total of Php 1,000.00 for 5 pax inclusive of tour guide, environmental fee, helmet and flashlight rental, and tips for the 2 guide. Enchanted Balete tree in the town of Lazi was our next destination. This is said to be 400-500 years old which has a small pool in front with lots of fish in it. For a couple of minutes, we dipped our restless feet and fishes swarmed around, biting our dead skins off. Instant foot spa! Admission is free to this tourist spot. They just have a donation box near it and Php 25.00 parking fee. 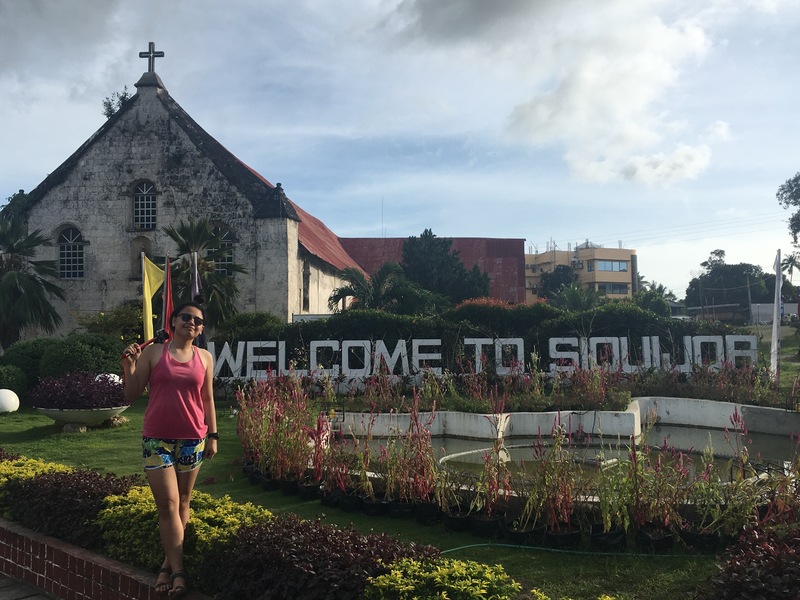 Still located in the town of Lazi is one of the oldest church in Siquijor Island. It is also called San Isidro Labrador Parish Church and was built on 1884 in which, until now, still holds mass. Another tourist destination in the town of Lazi is Cambugahay Falls, just 10min drive from the church. The falls is easy to find with signage from the National Highway. You need to descent for more than a hundred steps to reach the stunning clear blue falls. Next on our list was the famous Salagdoong beach. Located in the town of Maria, it is famous for its cliff jumping site with breathtaking view. There are 2 cliffs and a slide but unfortunately, they closed the access to slide during the time. For our last stop, we visited a famous bakery in the island, Lilibeth Pan Bisaya. Located in Brgy. Binoongan, it is just 10-15mins away from Salagdoong beach. As seen in the above photo, she was holding Asia travel magazine, which she was featured on. She was famous for her delicious “Torta” and other breads like ensaymada, bukayo and pandesal. Travel host Drew Arellano also paid her a visit on one of his “Byahe ni Drew” episodes where he featured the whole island’s attractions. I also had a photo with our cool tour guide, kuya Loloy. You can haggle for a better price for the tour package, but I believe he is one of the few who offers cheap tour but will definitely give you the best service. You can contact him at (+63) 0935 362 3541. Please see my next post for the continuation of my backpacking adventure. Ciao!